This Rumble ended on 2003-07-01 00:00:00.0. History: Cyan has long haunted the realm of Silvanesti looking for different methods to instill fear and anxiety in the already xenophobic elves. Current Objective: Total annihilation of the elven race. Personality: Cruel and Intelligent. When provoked can be an extremely strong opponent. Special Abilities: Ability to manipulate the power of a dragon orb to create a false reality of a waking nightmare. Quote: " Lullaby and goodnight, Those blue eyes close tight, Bright angels are near, So sleep without fear "
Strengths: Equal or Stronger power then the Matrix Agents in the ability to manipulate the matrix. History: Once a coppertop, Neo was unplugged and thought to be "the one". He displayed an ability to manipulate the Matrix, a program that all humans are plugged into. Now joining the resistance, he is now hacking the Matrix and destroying the Matrix from within. Current Objective: To unplug as many humans as possible from the Matrix. Personality: Cool and Calm. When provoked can be an extremely strong opponent. Special Abilities: Ability to manipulate the programming of the Matrix through the force of his own will. Quote: "Ever had that feeling where you're not sure if you're awake or still dreaming?" This was not what Neo had been expecting. He stood in the clearing, coat billowing artistically about his body, and took a long pause to assess this situation. His conclusion was the same: this was definitely, definitely not what he had been expecting. The message Tank had found had been simple enough: "Neo; I know what the Matrix is. I need to be freed. Please meet me at the sunset of the day following the date you read this. - CB"
What followed next had been a strange blurring of reality and his arrival in lush forest surroundings. From behind a verdant tree the largest lizard he had ever seen slithered towards him. "You have arrived just as Mr. Anderson said. Perfect." "What are you? What have you done with the person I was supposed to meet?" Neo shouted. 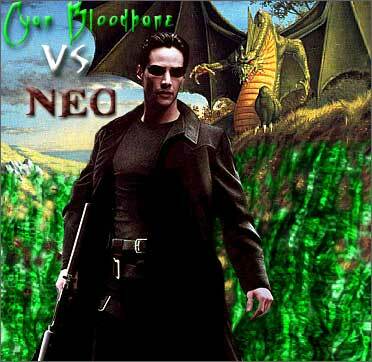 "So you are the one called Neo," the dragon stated. "I came here to meet with you. I sent you that message. I am called Cyan Bloodbane." "CB," Neo whispered to himself. In a louder tone he called out, "What do you want?" "I want you to work for me," the dragon replied rubbing its green scales against the tree tearing the bark to shreds. "Your unique knowledge of false realities can be very useful in the Nightmare I have created around Silvanesti. I will require you to use you powers against the elves, a race of people that are nothing more than vermin. If this plan fails I will dupe them into creating a "protective" shield that will slowly drain the life from them to supply its power." "How stupid to you think I am?" asked Neo. "The Matrix must be malfunctioning." "This is no malfunction. If you wish to return to your world, if that is what you call it, you will serve me." "I will NOT have a hand in creating a new Matrix!" shouts Neo. "You will serve or you will die," Cyan Bloodbane mutters, preparing to expel a cloud of noxious gas and extending the nightmare realm around the pair. "You will walk the way of death Neo. For every hideous creature ever conceived in the twisted tortured dreams of mortals will arise to stop you. As you walk through this dream, nay nightmare, you will face your greatest fears and they will be stronger than you can imagine," Cyan whispers.